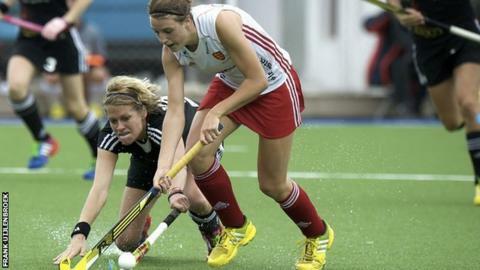 England beat European champions Germany 3-1 to finish second in their group at the World League Final in Argentina. Two goals from Alex Danson and one from Sophie Bray gave England their second win at the tournament for the top eight nations in women's hockey. The Netherlands beat Korea 3-1 to top Pool A with three wins out of three. England will face China in the quarter-finals on Thursday after the seventh-ranked Chinese lost 3-1 to Argentina to finish third in Pool B. Having lost to Germany on penalties in this summer's EuroHockey final, England enjoyed a measure of revenge on a rainy afternoon in San Miguel de Tucuman. An unmarked Danson provided a quick response following Eileen Hoffman's opener for Germany in the 14th minute, and England looked to have taken control through Bray's sharp finish early in the second half. However, loose discipline saw Laura Unsworth, Sally Walton and Helen Richardson-Walsh each sent to the sinbin for five minutes at various stages of the second half. Down to nine players on occasions, England had to withstand heavy pressure but were well marshalled by captain Kate Richardson-Walsh, winning her 200th cap, and they held on for their second win of the week. Richardson-Walsh said: "It felt like a typical English day out there. With the rain lashing down and the pitch playing quite slow, we really had to work hard for the result. "Two hundred England caps is not something I ever imagined I would achieve when I started playing back in 1999 and to seal it with a win in a game like that is really special." England head coach Jason Lee added: "Germany have had the edge over us this year so it was nice to get our own back a little bit."